I am an unabashed superfan of the Netflix series, Chef's Table. So, you can imagine how excited I was to watch the new mini 4-episode 4th season. Episode 2 features chef Corrado Assenza, a gelato and pastry maker at Caffè Sicilia a Noto in Noto, Sicily. One of Corrado’s specialties dishes is lemon & almond granitas. Sicily is hot, just like south Florida and so Sicilians enjoy the tradition of granitas for breakfast instead of hot coffee. 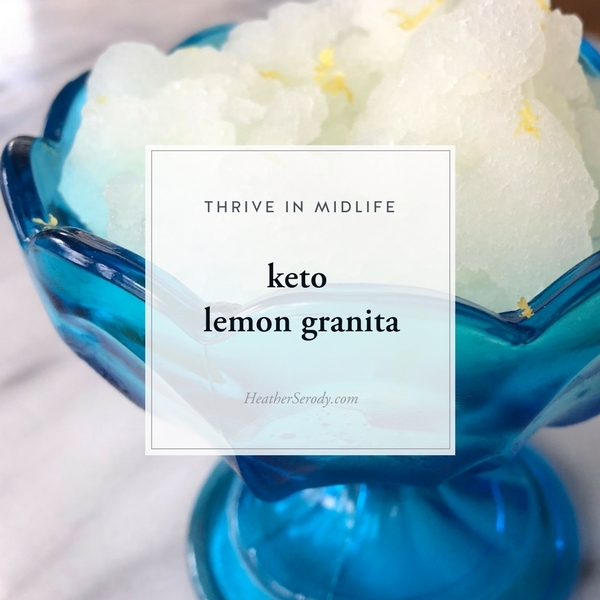 The lemon granitas looked so good, I immediately began experimenting with a keto friendly version. Granita is an Italian style flavored ice and made with sweetener, water, and fruit juice. Granita is traditionally mixed in shallow pans, and periodically stirred and scraped with the tines of a fork every 30 to 40 minutes as it's becoming frozen until it takes on a slushy consistency. This entire process traditionally takes 3 to 4 hours to complete before it is spooned into chilled stemmed glasses or bowls. But, don't worry you don't have to work that hard to make delicious low-carb lemon granita. Making Keto lemon Granita becomes simple if you have a Cuisinart Ice Cream Maker. If you are living the keto lifestyle, I highly recommend investing in an ice cream maker! For some reason none of the ice cream brands have gotten the memo to make low carb ice cream with keto approved sweeteners and not artificial ones which taste awful and aren't natural. Besides, when you taste how good homemade ice creams and granitas are and see how easy it is with your own ice cream maker, you'll probably never want to buy store-bought ice cream again, anyway. Pour all of the ingredients in the frozen bowl of your ice cream maker and give it a quick stir. Place the mixing arm in, cover, select the ice cream mode and hit start. My granita took about 20-25 minutes of churning to freeze. Serve immediately in a stemmed glass or small bowl. Optional: grate some lemon zest over the top. Or transfer your granita to a freezer-safe container & store in the freezer. Note: the only macros in this recipe come from the 1.5 cups of fresh lemon juice. Remove the granita from the freezer at least 15 minutes before serving to soften slightly. Using a sturdy fork, scrape the tines of the fork across the granita to make it slushy before scooping it into a stemmed glass or small bowl. If you try this recipe, it really helps me if you would please pin the image on this page to Pinterest, and note that you ‘tried it' so that others will know how you liked it! While you're at it, follow me, too! Can I use no calorie simple syrup instead of the stevia.